@RespectTO on Twitter claimed that "Bloor has the worst rate for collisions in #biketo. Safe passage now. #topoli #BloorBikeLanes". They were rightfully celebrating the fact that we're one step closer to getting bike lanes on Bloor. Maybe I should have left well enough alone but I asked them: ". @RespectTO explain "worst". Gross numbers or per volume of cyclists compared to other streets?" It was an honest question but hard to explain intention in Twitter, thus my blog. How would we know Bloor Street is the worst and by what definition and measure? @RespectTO told me that it's according to City stats but they didn't have a link to share. Let me just be clear that I'm quite happy that Bloor is getting this focus and deservedly getting bike lanes (hopefully) to help make people safer. But I think it's worth digging into this a bit. In the past I have dug up and analyzed statistics to help answer such questions, so let's do the same here. The claim: "Bloor is the worst for collisions". How can we make the claim testable? We'll need to compare Bloor Street to other streets, obviously, but we can't just use the entire lengths of streets because then we'd be comparing apples to oranges. We need equal measures. More importantly, the Bloor Street bike lanes pilot is only going from Shaw to Avenue so that's the only stretch that might become safer post-install. 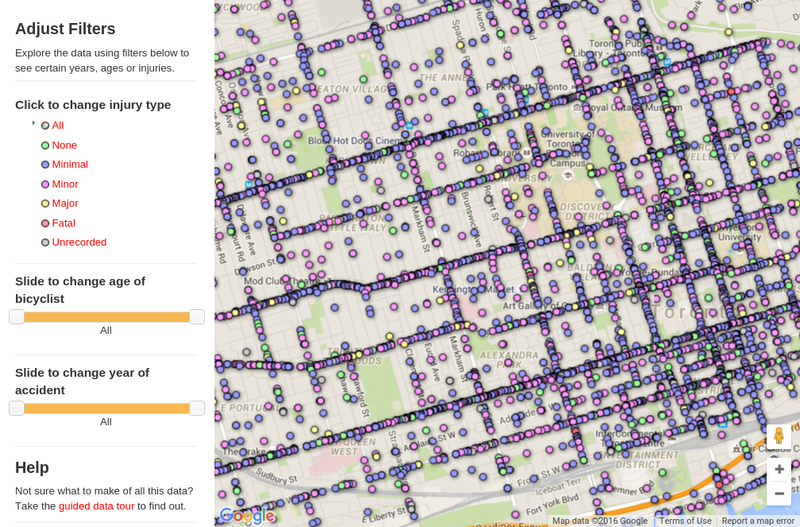 So let's compare the crash stats of Bloor from Shaw to Avenue to an equal length on an other street. I chose Queen St West, partly because it passes through the same cross streets as Bloor, going from Shaw to University, and because it's also a well-used route by people on bikes. (I could have also chosen Dundas, King or College for similar east-west streets.) Then I think if we just count all the collisions on Bloor and Queen along the same stretches we will know which one has had more collisions. Note that there are also different ways to interpret "worst". In the gross sense, we might be focused on the total numbers of crashes and trying to reduce them. From the point of view of an individual person on a bike, however, the concern would be about the risk of a crash, that is, which street is more "dangerous". In this latter case, we're more concerned about the chance of a crash per person. And for that we'd need to divide our crashes by the volume of people cycling since that can be quite different depending on the street. But this will be too much work and it wasn't the original claim, so I'm just going to focus on the gross numbers. The closest we have to crash stats by location is this map from a few years ago produced by the Globe and Mail, mapping out all collisions from 1985 to 2010. So Bloor and Queen are pretty close with Queen just edging out Bloor. We can speculate to why: maybe the average cycling volumes on Queen are a bit higher? Or maybe the streetcar tracks make Queen a bit more dangerous? We can't really know unless we have more data. I'd actually like to see if the numbers on Queen have dropped since the protected bike lanes on Richmond and Adelaide were installed, creating a continuous route from Shaw to University (and beyond). With people going to those alternative routes the volumes on Queen have dropped and hopefully the overall crashes. And I hope the same happens on Bloor. At any rate, I think we can conclude that the original claim by @RespectTO might have been true at some point (though I'm not sure) but it doesn't seem to be true anymore. But I will celebrate with them that we're finally getting bike lanes on Bloor. Thanks very much for this post Herb, and for chasing the details. I'm not on twitter to get in to the back and forths, but I'm glad for those who are, and yet the tweets don't tell it all. And neither do the stats, but thanks to the Globe for what they've offered - it's my main link to any crash data as the City likes to bury theirs it seems - maybe a liability ie. what are you doing to stop the carnage?? One thing ARC did over a decade ago, July 26, 2001 is send a notice of hazard to the City about the main core east-west roads of Bloor, College, Dundas, Queen and King. Nothing has been done; I'm not sure how much of this survives as I think the ARC website ebbed, and I just happened to have a paper floating around. It is helpful to have this statement that the City and its Bike Plan have both "failed to address these heavily-used cycling thoroughfares." It's most helpful to have this in context of having a class-action suit against the City; as it again seems that they're only willing to do (maybe) the simpler things like Bloor, which is easy to repaint as there aren't the streetscar tracks to dictate lane positions. The providing of bike safety for the longer east-west trips is waay less easy in the Queen area, and yes, let's hope that Richmond/Adelaide make the Big Difference, though it's far too short now, and we really need a single, safe, longer east-west route out to Parkdale, tho the road grid is challenged. Not quite as challenged maybe as the Bloor area as one goes west: Harbord ends at Ossington, and then what? as often side streets don't exist or end, and they all dwindle to main roads at the Rail Tracks. I'm quite pleased that on an earlier post on the new Bike Scheme you observe "that all the cyclists on College, Dundas or the ones trying to connect to the new cycle tracks on Richmond and Adelaide will get next to no relief. Parkdale and further west is mostly out of luck. Staff are taking the politically expedient route by ignoring the gaps on College in particular. College has the highest cycling traffic volumes in Toronto! College was one of the first to get bike lanes but looks like we'll have to wait at least another decade before anything improves there. For shame. Is it wrong to think that we should be prioritizing where people are already cycling and making it safer and more enjoyable for them?" Bravo! and maybe that opinion was lurking in my mind, as I'm peeved enough at the lack of on-road safety that I've asked for an Individual EA for the Rail Trail extension, partially for transit flux issues, but largely because the cycling environment in old Toronto is soo unsafe, sporadic, and off-balanced with the City's preference from Ford days to spend HUGE on off-road and too bad if you don't have a convenient ravine to take you to your work. The total of spend may be $22M, which is outrageous considering that it would be $75,000 ish to repaint Bloor from Ossington to Dundas St. W., and I'm content to get paint-only bike lanes as a start. And I'm also not so happy with having concentration within the Annex where the real needs are west of Ossington btw, so I've parted company with many others on this point too. Bloor could be easy with no tracks and the subway. It's not done. Queen St. should have had a subway built by now; it's not this generation's fault it wasn't built and we stupidly spend big on suburban subways that blight our budgets for decades. As per the Bike Plan, and updated Bike Scheme, and the West End Bikeways survey in between, cyclists want more safety on Bloor, College and Queen. The exact numbers may not matter so much; they are ALL needing improvements, and thanks very much for drawing attention to it all.